The Grand Bazaar isn't the only market you'll want to visit in Istanbul. Kadikoy Market, also referred to as Kallavi Kadikoy, is a large street market that is located on the Asia side of Istanbul. Though many visitors to Istanbul stick to the famous site-heavy European side of Istanbul (where the Grand Bazaar is), foodies and shoppers should definitely also make the short trek across the Bosphorus Strait to check out Kadikoy Market. Kadikoy Market has everything from fruits to pizza and ceramics to linens. It only operates on Tuesday and Fridays and on those days you'll find thousands of stalls selling a variety of wares and cuisine. Great deals are for the taking and haggling over price is perfectly acceptable. 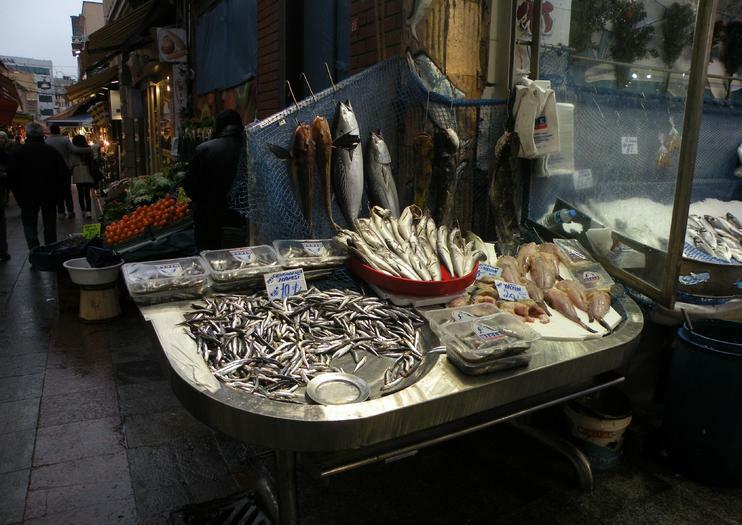 Visitors often enjoy having a meal at Kadikoy Market as there are many cafes and stands selling to-go food and hot meals mixed in among the produce and fish you can purchase, but will have to cook on your own. Keep an eye out for Lahmacun, or Turkish pizza as it's sometimes called, to try in between your haggling bouts. To get to Kadikoy Market take the 20-minute ferry from Eminönü to the Kadikoy stop. From there it's a 10- to 15-minute walk to Kadikoy. However, the walk does involve some incline so if you'd rather save your energy for shopping, hail a taxi at the ferry dock. Experience the rich flavors, fragrant spices and decadent sweets that characterise Turkish cuisine on this 4.5-hour Istanbul street food tour, including hotel pickup and drop-off. Explore the sights, scents and tastes that make the city unique, as you browse the vibrant Kadikoy Market on Istanbul’s Asian side, stroll along the Galata Bridge and discover the atmospheric Galata district. Best of all, you’ll get to sample plenty of local specialties along the way, from pide (Turkish pizza) to simit (bagel-like bread), to the best baklava in Istanbul. Sample some of Istanbul’s tastiest and most traditional foods on this 5.5-hour culinary walking tour around Kadıköy, with a food-expert guide. After a hearty Turkish breakfast, ride a ferry across the Bosphorus to Kadıköy on Istanbul’s Asian side, known for its buzzing food scene. Learn about the culinary repertoire as you visit atmospheric food haunts, try fresh fish at the fish market, sample treats such as ‘baklava,’ (syrup-drenched pastries), and savor some regional Turkish specialities at a traditional restaurant. Finish with a classic Turkish coffee before your return ferry trip.